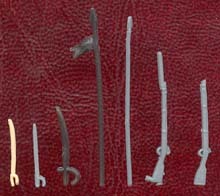 From time to time a set will be made that has some parts separate - usually weapons such as spears - to allow for better poses or occasionally to give the customer some choice. This characteristic is gradually becoming more common these days, but one company has set about offering customers, particularly converters, more choice right from its early days, and that is HaT. 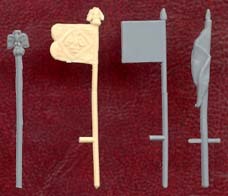 As well as the inevitably separate spears HaT have frequently supplied extra swords, standards and other items in excess of what was required by the figures in the box to allow the most to be made of both those figures and those in other sets. 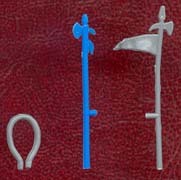 This principle was extended to their Napoleonic range, where a number of sets contain generic figures with a ring hand, and many different accessories have been made to fit them. 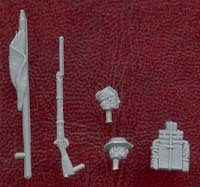 Going further still, some sets have also been provided with extra heads to allow converters to customise their figures still further. Making such small parts presents technical difficulties for the manufacturer, but with such a large range the customer is also faced with the problem of remembering which set contained which accessory. This page resolves that problem by providing an at-a-glance view of all these accessories and where they can be found.